The procerus a.k.a. Pyramidalis nasi is a small muscle which is found superficial towards the nasal bone and operates while a person frowns. In order to create transverse wrinkles superior to the bridge of the nose, the procerus pulls the medial margin of the eyebrows inferior. 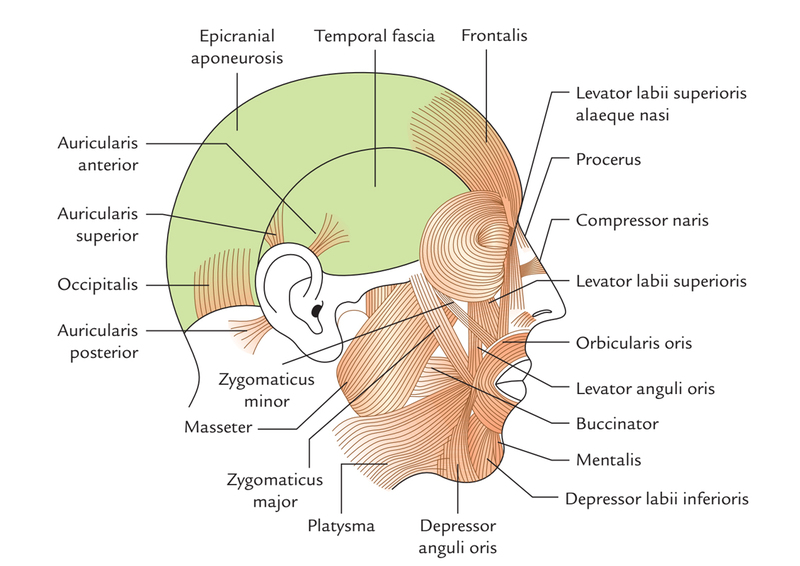 The fascia enveloping the inferior portion of the nasal bones. The upper part of the lateral nasal cartilages. The skin in the middle of the eyebrows. The lower portion of the center of the forehead. Its fibers merge with fibers of the frontalis in the same section and it is constant with the frontal belly of the occipitofrontalis muscle of the scalp. Procerus is thin, nearly 1mm and is approximately 1-4mm inferior towards the surface of the skin. A particular triangular sheet of muscle in the middle of the eyebrows is created by the procerus muscles of both sides. It helps in creating facial expression of anger, aggression, pain, frown, concentration, and disgust. Procerus creates transverse wrinkles in the skin located over the nasal radix. It lowers the brow and may secondarily support flaring of the nose via setting the upper part of the nose. The procerus gives a roof over the eyelids. It helps in protecting eyes from the glare of the sun. Compared to males (16.4mm) the procerus muscle is a little longer in females (19.1mm). It is classified as a brow depressor and creates the horizontal rhytides in the nasal root area as procerus contraction lowers the medial head of the brows. Procerus is related to transverse lines and it is location which targeted in wrinkle treatment. The structure and function of procerus muscles is studied by scholars in plastic surgery/cosmetology for transverse wrinkles and glabellar frown lines. Excessive exertion of the procerus muscle and corrugator supercilii causes wrinkles. This can be corrected with the injection of botulinum a.k.a. botox procedure. This method has also aided people having thyroid orbitopathy. The procerus muscle may be incapacitated as a single injection in the central part of the muscle with either 2.5 to 5 units of BOTOX or 7.5 to 15 Dysport units. If done correctly it will not cause the drooping of eyebrows.